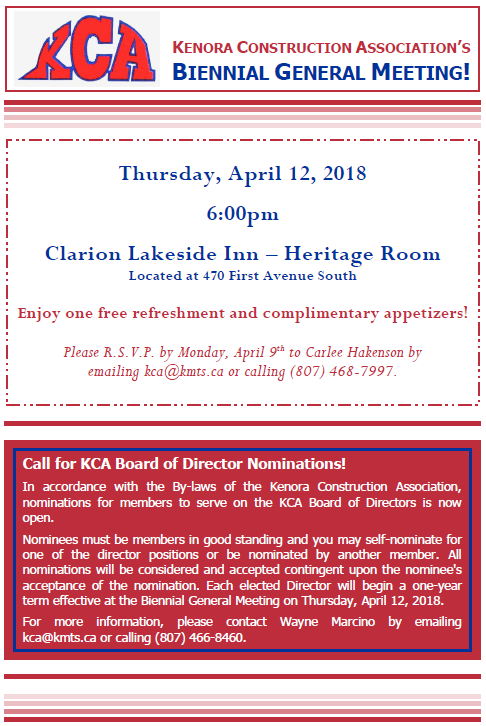 The Kenora Construction Association invites you to join us at our Biennial General Meeting on Thursday, April 12, 2018 at 6:00pm at the Clarion Lakeside Inn – Heritage Room. Enjoy one free refreshment and complimentary appetizers! Please R.S.V.P. by Monday, April 9th to Carlee Hakenson by emailing kca@kmts.ca or calling (807) 468-7997. 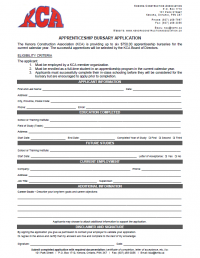 In accordance with the By-laws of the Kenora Construction Association, nominations for members to serve on the KCA Board of Directors is now open. Nominees must be members in good standing and you may self-nominate for one of the director positions or be nominated by another member. All nominations will be considered and accepted contingent upon the nominee’s acceptance of the nomination. Each elected Director will begin a one-year term effective at the Biennial General Meeting on Thursday, April 12, 2018. 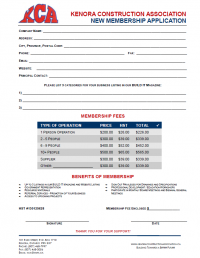 For more information, please contact Wayne Marcino by emailing kca@kmts.ca or calling (807) 466-8460.